This is the discussion related to the wiki page	SCP-2649. Hello! This is my third skip, but it's my first one involving an animal-like anomaly. I frankly rather like this one - writing about something that might be actively hostile, and is actively trying to breach containment, was a nice change from writing about objects that can only kill people if the Foundation screws up. This image has been edited to remove the pink color from its background. Images used in posted articles must comply with the site's image policy. A source must be provided on the discussion page and the source must be compatible with the site's license. The author will be notified after this posting via Wikidot PM and will have 48 hours to properly source the image before it is edited out of the page. To note, the currently listed source does not appear to be compatible with the site license. What more did I need to do to source this image? I gave credit to the creator, using the quick attribution on the image policy page. 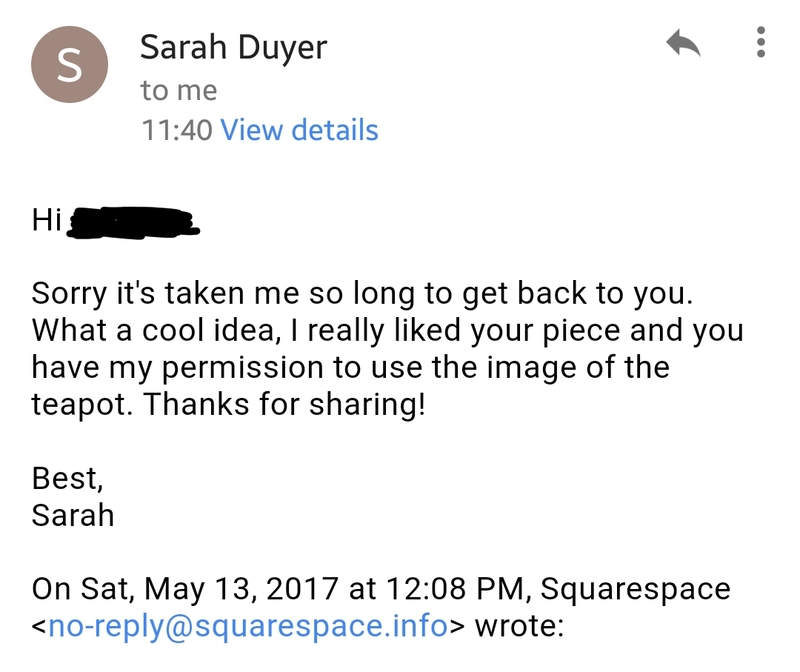 Yes, but has Sarah Duyer released the image under Creative Commons, or specifically given you permission to use it? If neither, ask her directly. Many times, someone will be happy to get more exposure and say yes. Make sure you mention that it will be released under Creative Commons if they do say yes. …Oh. I can do that. Question, if it takes longer than the timer, can I add the image back in if it has been removed? And how do I cite that? Just copy-paste her response? You can readd it if it takes too long assuming you get permission. Your best bet is a screenshot as proof of permission. Alright. This is really not the best time for me, so I'll probably be readding it. To be perfectly clear, cause I don't want this to be a point of confusion: You can only add the image back after you have permission. Out of curiosity, how else would that have been interpreted? Also: I've sent the message. Awaiting a response now. Image has been edited out until a compliant source can be found. I got a response, and I have a screenshot here. Is this enough to add the image back in? That is sufficient, thank you! No doubt about the Series I vibe here; I'm reminded of both the Old Man and the Heart of Darkness. Is it nostalgia that you're trying to elicit from the reader? Because there isn't much else here; nothing scary or particularly interesting about the creature. This isn't helped by the fact that everything after the description is redundant. I can't glean anything from the addenda that hasn't been plainly stated in the description. The exploration log is not nearly extensive enough to provide any potentially interesting insight into the anomaly, so it feels quite bare at the moment and I'm not sure how I'm supposed to react to it as a result. Overall, this didn't make me feel anything at all; the narrative angle of attempts to breach containment isn't compelling here. Fair enough; Anything you think I can do to improve it, or is there just not much that can be done at this point? With the exploration log, I was expecting something that would perhaps allude to some of the questions surrounding the anomaly, regarding it being a sentient teapot for instance. The description of the pocket dimension is vivid and is the strong point of the skip for me, with all the strange 'debris' floating around. Perhaps some kind of revealing story could be crafted out of a traditional-style exploration with D-class or drone. The description of the pocket dimension is vivid and is the strong point of the skip for me, with all the strange 'debris' floating around. Perhaps some kind of revealing story could be crafted out of a traditional-style exploration with D-class or drone. Really? Honestly, I thought that was the weakest point and considered dropping it. I might maybe see what I can do about that, but I dunno what you're expecting to find other than random debris. It's a pocket dimension, not the creature's actual innards. I can see why some people might turn their heads at this, but seriously, sometimes we need the no-story simple SCP once in a while. I was glad to help out at least a bit with this. I like how instead of getting more and more powerful, he's getting more smart, which is always a plus for me. Cool stuff. The article is clear, tightly plotted, backed by an interesting concept, and a fourth thing that I forgot. If this is your first SCP, I look forward to your future entries. Incidentally, this feels like it could easily be adapted into a Stand from JJBA. This is his third SCP actually, he has written 2917 and the negative mass weight. Unfortunately (Or perhaps fortunately?) it's not my first - I also wrote SCP-2917 and SCP-2597, so I don't get to hide behind a lack of experience if I write something of low quality. The latter is probably gonna be my highest rated for a while. Not sure I can top that, actually. No offense taken. I'm glad you enjoyed this one! I think my favorite thing here is the understated treatment: A weird critter that earned its SCP file not by being extraordinarily dangerous, but because it keeps figuring out new ways to make a nuisance of itself. It's cute, but it's also kind of "what if 106 was a teapot?" Honestly, my suggestion would be to give it some personality. Is it mischievous? Is it really trying to kill and eat people with its weird black tea-portal? You could probably get motivation through on another incident log or two. As it stands, it just doesn't have much substance. what if 106 was a teapot? Oh, crap. I didn't even think of that. Edit: I mean, it kinda isn't though. It doesn't phase through walls, it's non-sapient, not instantly hostile, and this pocket dimension is little more than a stomach rather than 106's playground realm. Random research barges in: NOOOO!!!! !